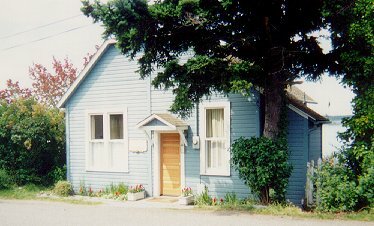 In the seaside town of Coupeville an old cottage has been renovated and modernized to provide visitors with a most convenient and charming accommodation. The cottage is situated right on the waterfront and within walking distance to all of the town's amenities. You may have breakfast delivered from an excellent cafe or cook for yourself. The cottage has one bedroom with additional sleeping places in the bedroom's loft or in the hide-a-bed in the living room. There is a large deck looking out on the beach and the town dock which accommodates vessels of all sizes and seaplanes. In the distance you can see the Cascades and Mt. Baker and the north shore of Penn Cove. It is truly one of the prettiest locals in all of Puget sound. This and other Whidbey Island Bed and Breakfast Inns can be found here in The Register.